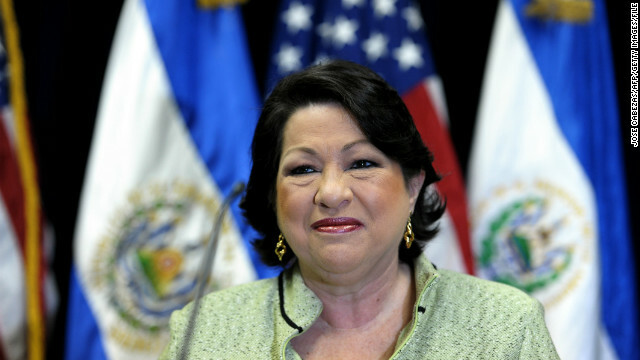 Supreme Court Justice Sonia Sotomayor recently released a new memoir. that blooms in my heart." Washington (CNN) –With "candor comes a measure of vulnerability." Sonia Sotomayor wants readers to know in the first pages of her new memoir that this will be different from other books by members of the Supreme Court. The dynamic story of the first Latina to sit as a justice seeks to inspire by revealing often-painful chapters in her self-described "extraordinary journey": her father's early death from alcoholism; a complex, often distant relationship with her mother; growing up poor in the Bronx projects; self-doubts about her looks, brief failed marriage; and professional path. But her strengths are celebrated, too: self-reliance to the point of giving herself insulin shots at age 7, after being diagnosed with diabetes; her loyalty to a large circle of friends; and vivid pride in her Puerto Rican heritage. "Experience has taught me you cannot value dreams according to the odds of their coming true," she writes in "My Beloved World" (Knopf/Random House). "Their real value is in stirring within us the will to aspire. That will, wherever it finally leads, does at least move you forward."